Please check back soon for more details on Pento in the News. In the meantime, please contact us for more details. It’s been a wild ride on Wall Street lately. Major averages had hit their highs in late September. But if this sell-off continues, it will be Wall Street’s worst year since the financial crisis and the worst December since the Great Depression! This should have been enough to shake investor confidence. 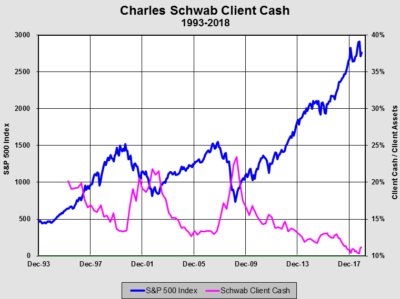 But judging from the data in the chart below, compiled by my friend Kevin Duffy of Bearing Asset Management and using data from Charles Schwab, we see that investors on both the retail and institutional level have a near-record low level of cash. They are anything but scared of this market. This data was compiled on November 30, 2018, when cash levels registered just 11.2%. That was not up much from the low reading of 10.3% held on September 30th. The retail investors is, relatively speaking, all in. And, analysts aren’t pulling in their horns either. According to FactSet: Overall, there are 11,136 ratings on stocks in the S&P 500. Of these ratings from Wall Street analysts, 53.9% are Buy ratings, 40.8% are Hold, and just 5.3% are Sell ratings. Yet, with the mounting weight of evidence in favor of a sharp slowdown in global growth, it has not dissuaded analysts from still having ebullient forecast for earnings growth next year. Analysts are projecting S&P 500 EPS estimates for the Calendar year 2019, according to FactSet, to grow at 8.3% with revenue growth of 5.5%. The global economy is showing signs of cracking now that QE has gone from $180 billion per month in 2017, to a negative number in 2019. That has sent the Emerging Markets into chaos and help lead European and Japanese economies into contraction. And now China, which has been responsible for 1/3rd of global growth coming out of the Great Recession, is entering into a recession. Of course, having the government force an increase of debt to the tune of 2,000 percent since the year 2000 guarantees a crash of historic proportions. In fact, the government in Beijing is so concerned about the current debacle that it has banned the gathering of private economic data. According to the South China Morning Post, China’s central government has ordered authorities in the Guangdong province – China’s main manufacturing hub–to stop producing a regional purchasing managers’ index. This means the province will not release the purchasing managers’ index (PMI) data for both October or November. Instead, all future purchasing managers’ indexes will be produced in-house by the National Bureau of Statistics. It is evident that Beijing is trying to suppress the dissemination of economic data because its economy is growing at a much slower rate than what the communist party will admit to…that is, if it is growing at all. This is hindering its position in negotiations with the United States in the trade war. And it also reiterates the complete lack of transparency in the Chinese markets and the desire on the part of the Chinese government to keep the world in the dark about the true state of its economy. Perhaps December’s continued debacle in global markets and economies was enough to begin pushing U.S. investors toward the exit–we will monitor this dynamic closely. However, history shows that it is a multi-month process to move investors’ psyche from euphoria to panic. This dynamic is still in its infancy. This entry was posted in Latest Commentary, Pentonomics on December 21, 2018 by pentoport. One such example of this is Chi­potle. According to Fortune Magazine, the company spent heavily on share repurchases in the first quarter of 2016, at the height of their E Coli scare. Subsequently, these shares have crashed, giving the company an ROI of minus 23%. This entry was posted in Latest Commentary, Pentonomics on December 17, 2018 by pentoport. First, let’s explain exactly what a “Fed Put” is. A Fed put is defined as The confidence of Wall Street that the Fed will lower interest rates and print money to support the market until economic strength will be strong enough to carry stocks higher. The term “Put” is ascribed to this because a put option is basically a contract that offers a buyer protection from falling asset prices. It was first coined under the Chairmanship of Alan Greenspan when he lowered interest rates and printed money to rescue Wall Street from its 22% Black Monday crash back in 1987. The practice of bailing out stocks was institutionalized by Ben Bernanke, and then became a bonafide tradition perpetuated by Janet Yellen. During the tenure of Ben Bernanke, the Fed Put took on new dimensions never before conceived. Such as a zero interest rate policy and the massive monetization of long-term Treasuries and Mortgage-backed Securities. The purpose of this strategy was to put a floor under asset prices and encourage the private sector to stop deleveraging. It was a total success. Wall Street’s mantra under Janet Yellen went something like this: The economy will soon improve and thus boost share prices. Or, if it does not, the Fed will keep interest rates at zero percent and force money down the throat of banks in the form of QE. With this, they will feel compelled to push a flood of new capital towards real estate, equities, and bonds, regardless of the underlying economic conditions. And now, Wall Street believes that investors have received the latest iteration of a central-bank Put following Fed Chair Jerome Powell’s recent comments. Mr. Powell gave a speech on November 28th at the Economic Club of New York, in which the Main Stream Financial Media was quick to assess that the central bank is now on hold with its tightening of monetary policy. Powell’s statement was indeed meant to moderate his pronouncement on October 3rd that the Fed Funds Rate (FFR) was very far from neutral and that it could actually go above neutral for a period of time. But, by now stating that the FFR is just below a “the range of estimates” does not mean the Fed is near neutral. Rather, that there is a low, middle and high-end in the spectrum of estimates; and that the current rate is just below that range. That’s it. However, Wall Street misinterpreted his statement as the Fed having achieved its neutral interest rate and is about to go on hold with further rate hikes. Nevertheless, the Jerome Powell Fed faces a much different dynamic than what both Bernanke and Yellen faced. Inflation targets have now been reached; whereas inflation was struggling to stay positive for much of tenure of the two previous Chairs. Not only this, but the FFR is not even half the level of where nominal GDP is currently—meaning it is extremely low by historical measures. And, asset prices are firmly back in bubble territory. Due to those asset bubbles and inflation rates, the Fed really has no choice but to raise the overnight lending rate for the 9th time during this cycle on December 19th. Otherwise, it risks long-term bonds spiking uncontrollably. The Fed also promises to hike 2-4 times next year. Therefore, a more realistic Wall Street mantra at this time should be: the Fed will continue to slowly raise interest rates and burn $50 billion per month of bank credit, and will continue to do so unless or until the stock market or economy undergoes a significant decline. Hence, the Fed will only end its reverse QE process and stop raising rates ex-post; i.e., after the economy enters a recession, or in the wake of a stock market crash. The truth is that the Fed is 180 degrees away from offering investors a genuine “Put” at this time, which would comprise the lowering of interest rates back to 0 percent and begin increasing its balance sheet through another iteration of QE. Therefore, the stock market is going to struggle due to a faltering economy, which will depress earnings and place further downward pressure on prices. Or, stocks will sink further into bear market territory because the Fed will continue to raise interest rates and make cash more competitive with equities—which still display extremely rich valuations historically. Of course, there is no doubt that a Powell Put is coming. The Fed’s unbroken tradition since 1987 has been firmly inculcated into the current Keynesian regime. Nevertheless, the safety net below the equity market still remains a great distance below current valuations. This entry was posted in Pentonomics on December 10, 2018 by pentoport. China is home to 18.5% of the world’s population. In order to micro-manage all these people, the Communist government has engineered a mass migration from rural areas into urban pre-planned cities. The government claimed this would allow them to better distribute resources. But the government’s biggest fear is a peasant’s revolt. By moving people into highly populated urban areas where they can be placed under constant surveillance by over 170 million cameras, helps Xi Jinping sleep much better. It also helps him implement China’s “Social Credit System,” where people gain and lose points by conducting their lives in allegiance with government policies. This is not a monetary reward system, but one where freedoms must be earned from autocrats instead of ordained by God. This centrally planned rural exodus has created an enormous real estate bubble. Therefore, home prices are trying to be stabilized by the government, which purchases the surplus inventory. But, this is becoming increasingly difficult to manage because the value of the yuan is coming under extreme downward pressure. The government now has a balancing act dilemma: print more yuan to support the real estate market and the economy or allow the housing Ponzi scheme to collapse. In some areas, home prices are already declining, forcing sellers to cut prices by 30%. Hence, the state of global growth lies within China’s ability to juggle its currency and debt-disabled economy. The nation has accounted for about 1/3 of global growth since the Great Recession. However, its Potemkin economy is now heading for a crash commensurate with the debacle currently witnessed in the Shanghai Stock Exchange. A handshake agreement between Trump and Jinping to work towards resolving the trade war isn’t going to ameliorate the primary issues behind anemic global growth. Rather, look for this to provide just a relief rally across financial markets. But that should prove short-lived, as the Fed continues to slowly raise interest rates and burn $600 billion worth of cash during fiscal 2019. And, as the ECB shuts down QE entirely in December and prepares to raise rates later in ‘19. This is because the immutable and baneful reason behind the weakening global economy consists of record global debt that was issued to push asset prices to record highs. The dagger to those bubbles is rising interest rates. Now that central bankers have achieved their inflation goals, especially in asset prices, they really have no other choice but to continue on a hawkish path; or risk asset prices, debt ratios, and long-term rates rise out of control. This entry was posted in Pentonomics on December 3, 2018 by pentoport. President Trump’s plan to stimulate the economy, known as The Tax Cut and Jobs Act, was signed into law at the end of 2017. It ushered in a massive and permanent tax cut for corporations, along with a temporary reduction in rates for individuals. Consequently, earnings growth has soared this year when compared to the same period in the prior year. Companies in the S&P 500 grew their earnings by 25.6% in the third quarter of 2018 compared to the same period in 2017, according to FACTSET. And earnings growth is set to rise by 19% in the fourth quarter of 2018 y/y. But things aren’t looking nearly as good for next year’s comparisons. EPS growth for the S&P 500 in the first quarter of 2019 compared to 2018 is estimated–by the, it’s always sunny outside crowd on Wall Street–to be 9.5%. But this guestimate might very well turn out to be extremely optimistic. During the second quarter of this year, the economy grew at a 4.2% Q/Q SAAR. The third quarter growth in the U.S. saw the economy decelerate to 3.5%. And, according to Bloomberg, the estimate for fourth-quarter growth of this year will be 2.7%. Keeping with this trend in slowing growth, Q1 2019 is projected to post growth of just 2.4%–there is no doubt that the U.S. economy is in the process of decelerating. Given the strong headwinds hitting the global economy right now, and the fact that no economy exists on an island, it seems very likely that U.S. corporate profit growth could struggle just to remain in positive territory during 2019. Those headwinds include: The Fed continuing along its interest rate hiking path, while it also removes $600 billion from the financial system. Global central banks that have turned hawkish, causing the amount of QE to crash from $180 billion per month in recent years, to zero. Corporation are seeing profit margins shrinking from rising wages, much higher interest rates expenses and a stronger dollar. The end of trade war front-running, which caused a huge inventory build and a temporary boost to growth. Emerging Markets turmoil is worsening. The U.S. is posting trillion dollar deficits and that amount of red ink is only getting bigger, and finally, the debt-disabled global economy is rolling over hard, causing stock market collapses and putting downward pressure on consumers worldwide. In addition to all those factors, corporate profits face extremely difficult comparisons due to the lapping of the repatriation of foreign earnings, along with the tax stimulus package. This year started off with an extreme level of investor optimism. Equity markets were supported by the outlook for a continuation of synchronized global growth. Nevertheless, the global economy is now weakening, as global monetary policies are tightening into record levels of debt. This is causing turmoil in currency, bond and equity markets across the globe. In this environment, it seems highly likely that S&P 500 earnings will struggle to grow at all. Indeed, the level of earnings for the S&P could find it difficult to remain at the $162.48 level that is projected by FactSet for calendar 2018. Therefore, investors need to reprice the rosy forecast of $177.90 for TTM 2019 that is currently hoped for by Wall Street. Not only is it the case that EPS growth will be far less than the 25% seen earlier this year; it is very likely that there will be an earnings recession next year. If this is indeed the case, the market will be forced to place a much lower multiple on that plunging growth rate of earnings. The current forward multiple on the S&P 500 EPS is 15.6. But this considers a robust growth rate that is near double digits. If the EPS number next year comes in closer to the same low $160’s EPS level seen in the trailing twelve months of this year, the multiple on those earnings should be closer to 14x…at best. Hence, if this assessment is anywhere near correct, the S&P 500 should trade around 2,240 at the end of next year. That would equate to a drop of nearly 20% from the current level. 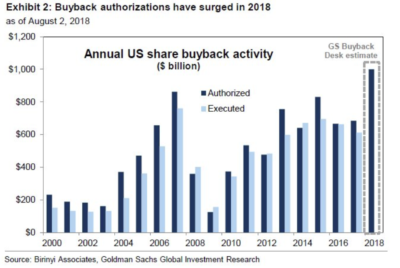 It is of paramount importance to note that those EPS figures are grossly overstated due to a decade’s worth of debt-fueled stock buybacks that have been prompted by near zero percent borrowing costs. Therefore, the fair value of the S&P 500 would only be achieved from a plunge much greater than 20%. The last earnings recession occurred during calendar year 2015; where EPS for the S&P 500 dropped by 0.3% over the year prior. During this timeframe, the return on stocks was essentially flat. However, if earnings undergo another year over year decline next year, the market may not fare nearly as well. This is because global central banks were busy printing nearly a trillion dollars’ worth of QE during the last earnings recession in order to pump up asset prices. In sharp contrast, during 2019 the amount of money printing, on a net global basis, is projected to become negative. Such a dramatic plunge in asset prices should come as no surprise. What other possible outcome could be expected given that global central banks printed $14 trillion ex-nihilo in order to manipulate every major asset class into an unprecedented bubble. But, now inflation has forced them to reverse course on monetary policy or risk having long-term interest rates spike out of control. Investors should already have their portfolios prepared for the third collapse of equity prices since the year 2000. This entry was posted in Pentonomics on November 27, 2018 by pentoport. And although the U.S. Ten-year Treasury note yield has never been negative in nominal terms, it is still clearly in the sub-basement of history. This entry was posted in Pentonomics on November 12, 2018 by pentoport. This sluggish growth and a near 30% plunge in Shanghai shares prompted swift action from the Chinese government, which announced plans to cut personal income taxes and cut the Reserve Requirement Ratio for the fourth time to encourage more leverage on top of the debt-disabled economy. The government has even bought ETF’s to prop of the sinking Chinese stock market. As a result, shares recently surged 4% in one day. However, more than half of those gains were quickly reversed the following day as investors took a sober look at whether the Chinese government is starting to lose its grip on the economy. All this concern about decelerating growth is hindering China’s deleveraging plans that it promised to follow through on at the beginning of this year. According to the Financial Times, Chinese debt was in the range of 170% of Gross Domestic Product prior to the Great Recession. But in 2008, China responded to the financial crisis with a huge infrastructure program—building empty cities to the tune of 12.5% of GDP, the biggest ever peacetime stimulus. According to the Institute for International Finance, China’s gross debt has now exploded to over 300% of GDP. Bloomberg estimates the dollar amount of this debt—both public and private–at $34 trillion; others have it as high as $40 trillion. With a gigantic shadow banking system, this number is obfuscated by design. A further yuan de-valuation could panic the Asian block nations in a similar way as did the Thai baht back in 1998; Leading to mass devaluations and putting further downward pressure on emerging markets. But China isn’t the only wild card in the global growth deck of cards. Over in the Euro zone, Italy is brazenly threatening to move forward with a budget proposal that would obscenely breach the European Union’s budget guidelines. The bureaucrats in Brussels are threatening fines. But this doesn’t appear to be enough to inhibit the Italian government, which is intent on increasing social welfare programs, adding to pensions and giving workers a tax cut. These bold plans have led the rating agency Moody’s to downgrade Italy’s sovereign debt to one notch above junk. Uncertainty in Italy is a major geopolitical factor weighing on global sentiment. 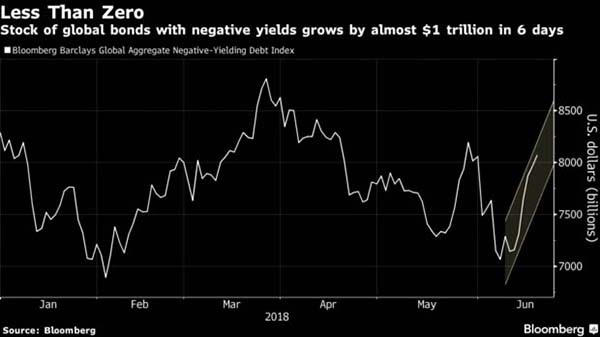 Investors are rightly concerned about the Rome-Brussels stand-off, given that Italy is the Euro zone’s third-largest economy and its debt is held by every major bank in Europe—and most in the U.S. As interest rates rise in Italy, the prospect of insolvency rises alongside. This entry was posted in Pentonomics on November 9, 2018 by pentoport. This entry was posted in Latest Commentary on October 31, 2018 by pentoport.